I waited until after the markets closed before posting this news, but the much maligned Tilapia Taco is no more. 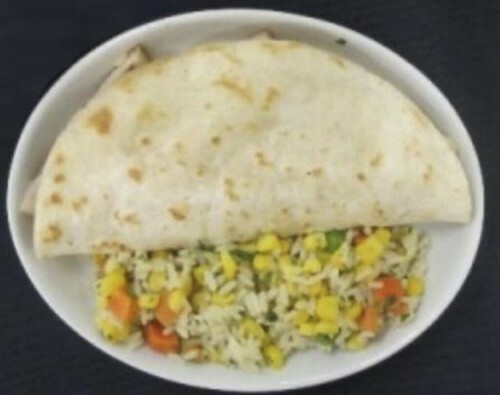 Introduced late last year when American refreshed their domestic First Class menu, the Tilapia Taco dinner has been the subject of some controversy. Some people have liked it and others have hated it. I can’t think of any other menu item that’s been so criticized. One person I know described it as horrible. I’ve talked to a few other people that have had the Tilapia Taco and opinions have been divided. Some are just grossed out by the idea of fish on a plane, others have declared it “tasty”. I finally had a chance to try it back in January. The verdict: I’ve never had tilapia before, so I’m not expert, but the taste was mostly that of cheese wrapped in a tortilla. It wasn’t bad, but it didn’t taste ‘fishy’, it was more like a cheese taco. DestinationDavid called tilapia the “tofu of the sea”, so maybe that’s the way it’s supposed to taste. Anyway, I heard a rumor that American received a lot of negative feedback about the Tilapia Taco and that it wasn’t a popular item. It’s been confirmed by another source at AA that it’s going away. So Tilapia Taco haters can rejoice! I also found out that the Indian Butter Chicken with Rice is being discontinued, which I think is disappointing news (small scale of course). It wasn’t my favorite, but I liked it and thought it was kind of creative. I hope that American doesn’t decide that they got too creative for their customers and go back to BBQ chicken salad and beef fajitas. Those were the only two items that my source mentioned coming off the menu. They did say that the Chicken Pot Pie wraps were popular and that American had received positive feedback about the new salads. I’ve had a chance to try each of their new menu items. My favorites are the Salad and Cold Udon Noodle with Beef, and the Chicken, Roasted Beets, and Pears Salad. The Moroccan Chicken with Rice is also very good. Something else that’s new is that for the last few months, at least since November, I’ve been offered a choice between two kinds of baked on board cookies: usually a chocolate chip or white chocolate chip cookie, and a spice or raisin cookie. I’ve even been on a few flights where they’ve offered seconds. I’m not sure that Robert Crandall would approve, but I’m liking the extra cookies! Fish on a plane can be done, I did not get an ordered veggie meal on LH C class. I settled for a fish meal without asking what it was. It was really good and it turned out to have been herring, cooked or baked. @ Charles – Fish on plane? I would never underestimate the ability of the Germans to pull it off! @ David – Thanks for the info. I used to have cichlids when I was a kid, so tilapia just joined goldfish on list of fish that I don’t eat. After markets action is going wild! Tilapia is carp. Carp raised on a farm and not from the sea. It’s generally fed dirt cheap GMO modified corn. This is why you can find filets for $2.99 at your local Wal Mart. It’s absolute garbage food. I’ve had tilapia before and hated it. I’m really not a fish or seafood fan! I’d rather eat my veggies than eat meat anyday of the week. @Mike G.: Tilapia belong to an entirely different family of fish than carp. Carp are cyprinids, while tilapia are cichlids.